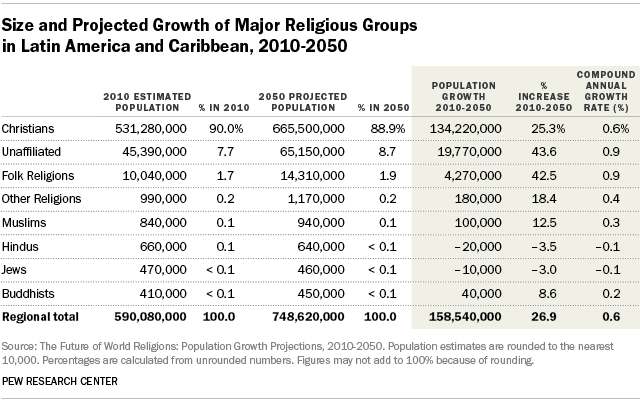 Christians are expected to remain the largest religious group in Latin America and the Caribbean in the decades ahead, growing by 25% from 531 million in 2010 to 666 million in 2050.59 The region’s unaffiliated population is forecast to have the largest percentage increase (44%), growing from 45 million in 2010 to 65 million in 2050. The number of adherents of folk religions is projected to grow by 43%, from 10 million to 14 million. The Total Fertility Rate of the religiously unaffiliated population in Latin America and the Caribbean is 2.3 children per woman in the 2010 to 2015 period, higher than the rate for any other religious group in the region. The relatively high fertility of the unaffiliated contributes to the group’s expected growth as a share of the region’s population. The fertility rate of Christians in the region is 2.2, equal to the regional rate and slightly above the replacement level of 2.1 children per woman. Total Fertility Rates for other religious groups were considerably lower than the regional average and the replacement level. 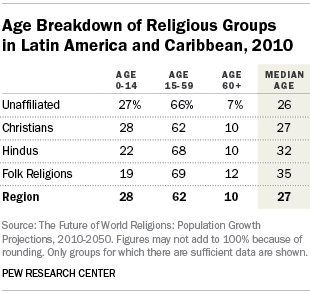 The median age of the religiously unaffiliated (26) in the Latin America-Caribbean region was slightly younger than that of Christians (27) and the overall population (27) in 2010. By contrast, the median age of Hindus (32) and those belonging to folk religions (35) was considerably higher. 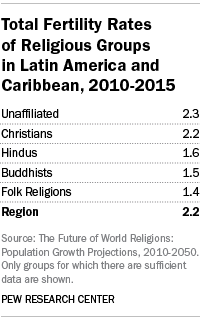 The religiously unaffiliated population in Latin America and the Caribbean is expected to grow in part because of religious switching. (For information on the impact of religious switching on the demographic projections in this report, see Chapter 1.) 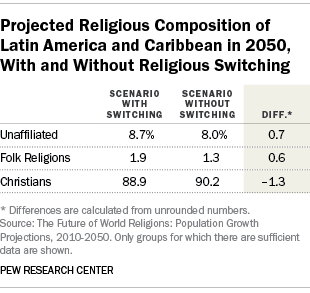 In a projection scenario with no religious switching, the unaffiliated share of the region’s population in 2050 (8.0%) would remain about the same as it was in 2010 (7.7%). Taking into account projected patterns of religious switching, however, the unaffiliated share of the population is expected to be nearly 9% by mid-century. The Christian share of the region’s population in 2050 is expected to be modestly smaller as a result of religious switching. What is each country’s second-largest religious group?